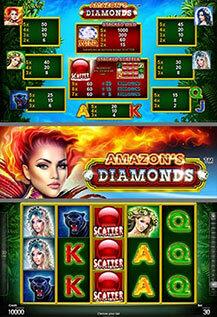 Enter the fantastic world of the Amazon jungles and win wonderful prizes on 30 lines and 5 reels! WILD DIAMOND substitutes for all symbols except SCATTERS. 7 or more scattered CRYSTAL BALLS trigger up to 30 free games (8 for 7 SCATTERS, 15 for 8 SCATTERS and 30 for 9 SCATTERS) on the 2nd, 3rd and 4th reel. Free games are played at current bet.